If you are looking for a “teddy bear” of a dog, the Bichon Frise Shih Tzu mix, also called a Shichon or Zuchon, might be just the one for you. She is, by some estimates, one of the best mixed-breed, or “designer”, dogs available. The Shichon, or Zhuchon, is small — about 9 to 12 inches in height and between 10 and 15 pounds as an adult. Shichons have an average lifespan of between 12 and 15 years. Her coat colors come in a wide variety, though they tend to favor the light shades. Oddly enough, a Shichon pup’s colors do not necessarily stay into adulthood. Her coat itself is thick, made of fine inner hairs and thicker outer curly hairs that give it that adorable “teddy bear” look. The Shichon barely sheds, which makes her the ideal pup for those with allergies. However, everyone is different, so the only way to know if you’re truly allergic is to spend some time with the dog you want to bring home before you actually bring her home. Shichons need, more or less, constant companionship, so they are not a good idea if you expect your pet to fend for itself for extended periods of time. On the other hand, that very characteristic makes Shichons ideal as “therapy” dogs. They do well as watchdogs too. The Shichon is the type of dog who will follow you around the house from room to room. She is devoted and loving – you are her whole world. Pets depend on their owners for basic care. The Shichon coat does not shed very much, but that’s only because her fur traps the dead hair. This means that your Shichon (Zuchon) needs daily (yes, daily) brushing, or else her fur will become matted and quite unmanageable. Seek out specialized grooming, including a haircut, every six to eight weeks. You may also want to check out 6 Easy Tips For Awesome Bichon Frise Grooming for some helpful advice that you can also apply to your Bichon mix. In terms of exercise, your Shichon (Zuchon), is quite flexible. She will happily accompany you on your daily walks. She also does reasonably well with a wide range of activities, including being relatively active in your home. To find out about the benefits of daily exercise for your dog, check out this article. Because of the very nature of a mixed breed — diseases are known to afflict purebreds simply pass by the mixed breeds — you can expect your Shichon (Zuchon) to enjoy a long life filled with robust health. However, you should still plan to meet with your vet annually for a good visit, just like you’d visit your own doctor. In rare cases, a Shichon can inherit diseases common to its parent breeds, like faulty tear ducts and breathing abnormalities from the Shih Tzu, or skin issues from the Bichon, so keep an eye out for signs of these ailments in particular. Note: Our Health is #1 Priority. It should be no different or your Zuchon. But you need to help him. The Ultimate Guide to Dog Health is the answer. This handy guide will help you recognize the symptoms of the health problems above. Get the knowledge to stay ahead of these terrible issues that can rob your lovely Affe from vigor and life. Help your friend make it to 14 yrs+ without pain and suffering. Keep in mind that all tiny dogs can suffer an injury while playing with younger children who aren’t as conscious as you are of your pet’s physical limitations. While she may look like a teddy bear, your child cannot treat a Shichon like one. Fractures are definitely a possibility, even if the Shichon only falls from a lower height but onto a hard floor. There is the concept of “generation” when dealing with crossbred dogs – and it’s an important one. A First-Generation crossbreed is one whose parents are both purebreds. A First-Generation dog, consequently, will inherit exactly 50 percent of each breed’s genome. In the case of the Shichon, or Zuchon, she inherits 50 percent from each of her parents. While one still cannot predict which parent’s genes will dominate the mix, there is more predictability here than with cross-breeds who are not of the first generation. In general, aim for a First-Generation Shichon. These are the healthiest dogs and the closest you will get to having the primary attributes of the Bichon Frise and the Shih Tzu in one pup. If possible, meet with the pup’s parents before deciding on which pup to bring home. This will give you a better idea of what to expect when the pup you choose matures. 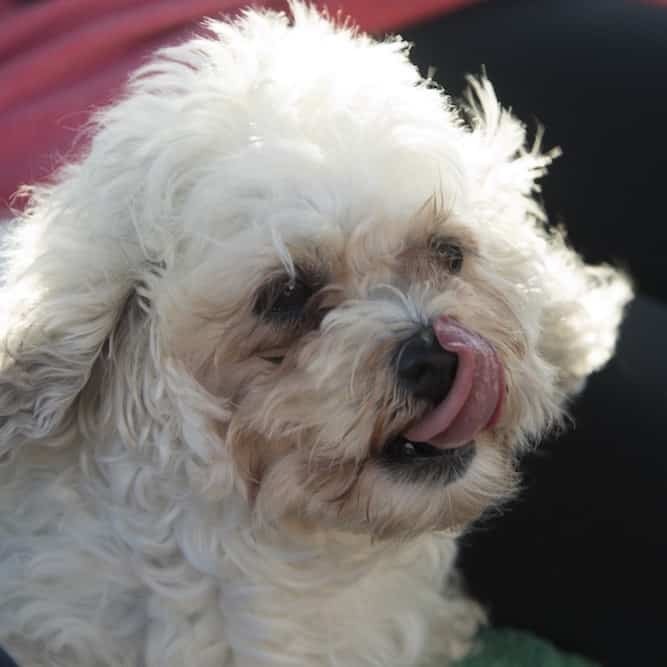 Check out my article “How To Choose A Dog That Makes The Perfect Pet,” and rely on this step-by-step guide to help you select the perfect Shichon for you and your family. Okay, first of all, did you know you can potty-train a Shichon? That’s right – you can actually train your Shichon (Zuchon) on how to use the toilet. And I don’t mean a wee-wee pad – I mean an actual human toilet! However, I only recommend this to the bravest souls out there because it is both time-consuming and incredibly frustrating. As far as normal training goes, she is a smart dog, but you must be patient with her training. As with many of the smarter breeds out there, the Shichon’s intelligence comes with a streak of stubbornness. For one thing, housebreaking can be a bit of a challenge. But persevere with her obedience training while she is still young, and she will mature into a lovable adult. Reward her when she does well, but don’t go overboard with the treats – else you risk making her obese. And that comes with a whole ‘nother set of health problems that you simply don’t need. Remember to remain patient and firm without being harsh. She will get it eventually, even if it seems like it will never happen. She just needs you to give her enough time to master it. For help with training your Shichon dog you should take a look at The Online Dog Trainer by Doggy Dan. Doggy Dan is an expert Dog Trainer based in New Zealand. His online resource contains Hundreds of Excellent Dog Training Videos that will take you step-by-step through the process of developing a healthy, happy well-behaved dog. If, after reading all of this, you would like to add a Shichon puppy to your family, you’re probably wondering where you should start. You can find a Shichon for sale from a breeder but be careful. It is crucial that you make sure the dog is both First-Generation and the dog the breeder says she is. Too many breeders try to pass off mixes that are not the right mix of breeds to make the Shichon. You can also adopt a Shichon from your local animal shelter. Your odds of finding a Shichon at your shelter are good since more mixed breeds end up at shelters than purebreds. The average Shichon price may vary, depending on the breeder you choose. She can be anywhere from $200 to $2,700. For some people, $200 for a Shichon (Zuchon) is a lot of money, but when you’re buying a dog, you truly need to be careful. Pay too little for a dog, and you’re likely to get either a sick dog or a dog who is not First-Generation. You could even end up with a dog who is not a Bichon Shih Tzu mix at all, but some other hybrid. This may be because the breeder either didn’t know what she was doing…or didn’t care. Most of the Shichons or Zuchons, available for adoption or rescue are adult dogs who ended up at the shelter through no fault of their own. Most of these dogs end up in rescue programs when their owners can no longer care for them. For example, this can either be due to financial hardship, or the addition to the family of a new baby who is allergic to dogs. However, adult rescue dogs have their benefits! They often have training from either the shelter or their prior owners, and they are not as wild-and-crazy as puppies can be. The adoption fee will vary, depending on who you choose to use. For instance, municipal shelters may ask for a donation averaging between $75 and $150. Private rescue groups, however, charge a higher fee. This is usually because they put more effort into making their dogs adoptable, like putting them with temporary foster families to measure how they are with children and other animals. Something else you don’t have to worry about: if you adopt your Shichon from an animal shelter, the shelter will spay/neuter the dog prior to the dog’s release. Some people decide to work with a Shichon breeder to purchase a Shichon for sale. This is all well and good, but with mixed breeds, you must be extremely careful with the breeder you choose. For one thing, you must make sure you find an ethical breeder and avoid puppy mills or pet stores. Places like these are only out for the money and don’t care about you or the dogs they sell. If you’re new to all this, you may not know how to spot an unethical breeder or puppy mill right off the bat. One thing you should know, though, is that there is a serious problem in this country with pet overpopulation. Animal shelters are overflowing to the point where they have no choice but to euthanize their animals because they simply can’t find homes for them all. That being said, unethical breeders and puppy mills produce puppies for the sole purpose of making money. They don’t care about their puppies’ health or personality. They also do not realize or care that the puppies they produce will likely go on to reproduce, making more puppies that will eventually end up in shelters – perhaps even euthanized. Responsible Shichon (Zuchon) breeders, however, pay close attention to producing the kind of happy and healthy puppies that become members of your family. They do not overbreed, and they make sure they find a good home for every one of their pups. In the case of a mixed breed breeder, an ethical breeder will not mix the breed past the first generation. And when she says the dog is a Bichon Shih Tzu mix, that is exactly what you get. It can be frustrating and time-consuming to find an ethical breeder, but trust me, it’s worth it – both for you and your family and the dog you bring home. The Bichon Frise/Shih Tzu mixed breed, a.k.a. the Shichon or Zuchon, is gaining in popularity – and with good reason. She is a relatively low-maintenance dog, which makes her the ideal companion for somebody who lives alone. The Shichon, or Zuchon, also fits quite nicely into a ready-made family. She will not eat you out of house and home and, while she does require daily brushing, many find that this ritual is a great time for quiet contemplation; both human and animal seem to be all the better for it.